Hello, February! 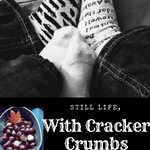 | Still Life, With Cracker Crumbs..
That cold weather must really have been very limiting. Good finally you were able to get out. Being opposite end of the seasons my goal is to order and stack firewood for Feb. Plus try and get the struggling dry vegie garden to survive a little longer! I always start thinking of gardens in February – hopefully you get yours to survive! 🙂 I know the struggle well. It was pretty limiting for me – with my little guy we couldn’t go out. He is too teeny for that level of cold! Thank goodness it has passed! Love the pics! And Joe’s Hamburgers sounds like a pretty good place! Your winter hike sounds awesome, and the bonfire too. I love a good bonfire when it’s cold out! And the owl- how awesome is that? Glad you guys got to enjoy nature a bit. I’m still feeling a little cabin fever from that weather last week! You really got hit with a doozy of a storm. You were so calm and collected. I would have freaked out at the thought of losing power. I’m glad you got a reprieve that following weekend. I think I need to make a list of lists in my BuJo. I want to have monthly goals, mostly for crafting. I did at least get two done for January but the paper did engulf me a bit as the artist in me can’t rush art. I was kind of freaking out. LOL. I had my husband pick up an electric space heater just in case the heat went out. I would not have slept with a space heater going but at least I know Wyatt would have been warm! I like the idea of a list of lists! I am a huge list maker too. You are right though, you can’t rush your inner artiste! My mom tried to teach me to crochet the other night. I was so terrible. My fingers and brain are not connected, I don’t think. Lol. It was an amazing pie! People line up out the door every weekend for a pie from Kate’s. 🙂 It was my first one ever and I loved it. I hope your month is going well too! Oooh, snow moon. I love that! I know right! Next month is not as cool – the Worm Moon. Lol.